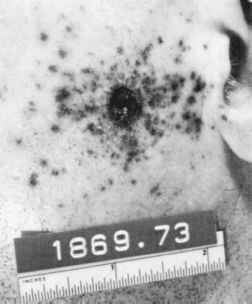 An intermediate-range gunshot wound is one in which the muzzle of the weapon is away from the body at the time of discharge yet is sufficiently close so that powder grains emerging from the muzzle strike the skin producing powder tattooing; this is the sine qua non of intermediate-range gunshot wounds. Figure 5.13 Powder tattooing from disk powder. shot. If an individual is shot at intermediate range after the heart has stopped beating, mechanical markings will be produced on the skin. These markings, however, will not have the reddish color, i.e., the vital reaction of antemortem tattoo marks. Postmortem tattoo marks have a yellow, moist appearance. They are less numerous than markings produced in the living subject at the same range. For handguns, forensic textbooks generally have stated that the powder tattooing extends out to a maximum distance of 18 to 24 in. (45 to 60 cm) from the muzzle. Such statements do not take into account the different physical forms of propellant powder. At present, in the United States, handgun cartridges are loaded with four forms of propellant: flake, spherical (true) ball powder, flattened ball powder, and cylindrical powder (Figure 5.14). Ball powder is favored in high-pressure loadings such as the .357 Magnum cartridge—because for consistent homogenous ignition of ball powder, high pressure, and thus high temperature conditions are necessary. In the past, however, ball powder was used for pistol loadings down to the .25 ACP. Some manufacturers use uncoated ball powder for better ignition. Grains of uncoated ball powder are a pale green color. Flake powder usually is in the form of disks though some foreign manufacturers produce flake powder in the form of quadrangles. Circular disks of flake powder can vary greatly in diameter and thickness. If the graphite coating is lost the flakes have a pale green translucent appearance.